Select a headstone you find interesting (or a family of stones) and register your project with Friends of Lone Fir Cemetery so you can connect with others who might be working on similar projects and get access to material that’s already available in our collection. If you’d like help selecting a stone, let us know and we can help. Research the individual or family. Review our report guidelines listed below so you know what to collect as you move along in your project. Share your progress and challenges with us so we can offer support and cheer your progress.Friends has very limited funding to assist volunteers with the costs associated with their research. Requests for financial reimbursement must be submitted to our Board Chair in writing prior to the expenditure and be approved by the organization’s Board. You will be notified of the Board’s decision in writing. If the request is approved, detailed receipts must be submitted for reimbursement. Be completely fact-based and include a source citation for each fact or document. Any citation style is acceptable so long as it’s used consistently and provides enough information for a future researcher to locate the source. Include the grave location (from the “Search Cemetery Records” link at www.oregonmetro.gov) and a description or photo of the stone. If it is upright/multi-sided, include what is on each side (noting directions north, east, south, and west). 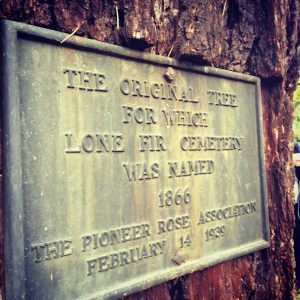 Friends of Lone Fir Cemetery appreciates your research contributions!